Stream and record up to 64 video channels with the WiseNet P PRN-4011 64-Channel 12MP NVR from Hanwha Techwin, at resolutions of up to 12MP. Featuring 12 drive bays supporting up to 12TB each, the recorder has a maximum internal storage capacity of 96TB (12TB preinstalled). It supports RAID 5 and 6 configurations. External storage options include PCs via internet connection, network servers, USB storage devices, and iSCSI storage devices. WiseStream H.265/H.264 and MJPEG compression are supported, enabling you to choose the format that works best for your application. The NVR enables simultaneous live viewing of up to 64 channels and simultaneous playback of up to 16 channels at resolutions up to 12MP via its HDMI and VGA ports. Up to 64 channels can be simultaneously recorded at full frame rate in 12MP resolution with an incoming bandwidth of up to 400 Mb/s. 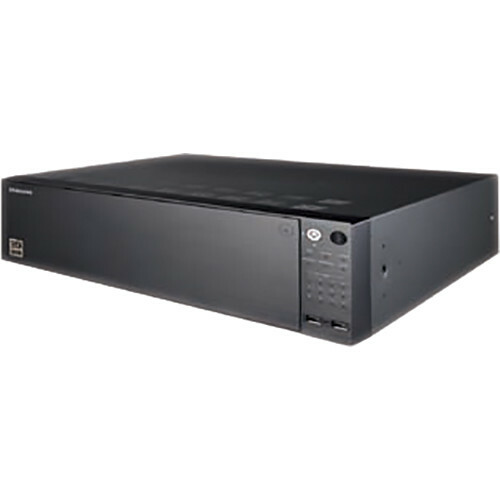 The NVR supports two-way audio communication, and is equipped with an RS-232 serial data port for connection to a UPS (available separately). Internet connectivity enables remote monitoring via PCs as well as from Android and iOS devices.